It makes sense doesn’t it? We should encourage and accept the qualities in children that we would like them to have as adults. No one would argue with that. And yet, sometimes the expectations we put on children don’t send this message. It’s easier for us when our children do what we say without question. But is that really something we want to encourage? What would you think about an adult who was described as ‘obedient’? You wouldn’t see that as a favourable quality. Instead of expecting obedience, perhaps we should aim for greater connection and communication. When children feel like they have a say and they know that their voice is valued, it is so much easier to problem solve together. It’s much less stressful too! Instead of having to be the one always in charge and enforcing the rules, you are a partnership working it out together. We apply arbitrary rules instead of allowing children the freedom to decide things for themselves. We tell them when to sleep and when to wake up, when to eat and how much, what to wear, when they can play and when they have to stop, where they can go, and to ‘be careful!!’. Imagine if someone required you to live on their timetable. How frustrating that would be. I know it’s controversial to say that things like bedtimes aren’t necessary for children. But instead of reacting negatively to the idea, assess why you feel that way. What has led you to believe this? Could you give it a try? Your children just might surprise you with how capable they are of listening to their own bodies. Society seems to be less than accepting of children’s feelings. As soon as a child cries there’s someone there to distract, or shush them, or tell them ‘you’re ok‘. Sometimes you don’t feel ok and you just need to cry right? Imagine if at those times your partner told you, ‘shhh…you’re fine, oooh look some chocolate!’. Ok I’d probably eat the chocolate, but I wouldn’t be too impressed with my feelings being dismissed like that. It’s uncomfortable to hear a child upset, of course, but it does them no good to gloss over it. Let them feel what they feel. Nothing will ever be perfect all the time. In fact, sometimes everything will go wrong! No matter how you parent. Let’s give our kids and ourselves a break. What is the goal of parenting? Is it to have a perfectly obedient child who does what you say, never makes a fuss, is always quiet, polite, and never talks back? If so, parenting is going to be a struggle. These goals are not only unrealistic but actually contrary to bringing up the kind of adults that we want. I don’t know about others but I’d prefer to bring up children who are not afraid to speak up, who know their voices are powerful, who have had lots of practice in making their own decisions, who are intrinsically motivated, who are confident and happy. I feel like a lot of the traditional expectations society puts on children are in direct opposition to these goals. And also to nurturing a close and positive connection with your children. I don’t want to be fighting against them, I want to be working with them. So I’m letting go of these expectations. I’m showing a lot more trust. These little humans are amazing and very capable when given the chance. 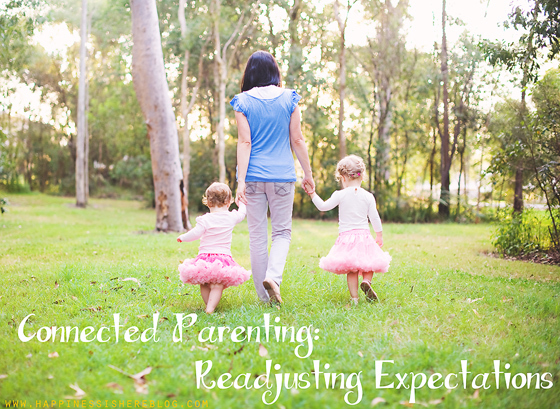 What expectations do you have of your children? Are there any that you’re still holding onto that might be negatively affecting your relationship? What are you working on letting go of to allow a deeper connection? When my 20month old son climbs down stairs confidently (without my help) it is normally met with awe but also a stern be careful directed at my son. When he points at himself and then stairs to indicate he’s capable of climbing down, instead of praising him for his independent streak and self confidence, he is called haughty!!! It bogs me down just to think of their negative approach toward children. Its tiring. Trusting one’s child frees the parent! I haven’t actually written about that. I must be super lucky but it’s not that common for me actually! If someone was sternly saying ‘be careful’ I might just reply that my child is fine and then to my child that I trust them and they know what they’re doing. These situations are so difficult and awkward but I reckon we have to stick up for our kids 🙂 Just kindly and firmly. Great post! Just what I needed. Question: my 8 year old son is very independent, questions everything and doesn’t like to follow the rules. I see him as a great leader in the future but every day’s life can be a challenge. Any suggestions how to make things easier for everyone? Hi Magda. What is challenging for you? I love these two posts on boundaries that might help? Hi! Do you have updates on these links? I’d love to read about boundaries and what to do when they’re being crossed. My 5yr old is hitting everyone, even the baby, and screaming which scares the baby a lot, and we’re having a hard time knowing how to deal with this in a positive way. We’re new to this (so I know she’s working through some disconnection and estsblishing trust), but I know we need boundaries to keep everyone safe, physically and emotionally. Thanks! This is a really good post. It does make me think as well and I realise that the most stressful times in our house are usually when we have to be somewhere or are running out of time and I am barking orders at my children. When there is no deadline and I have time and patience to encourage independent choices about what to wear today, what to have for breakfast, which shoes to put on, which toys to take out with us etc we end up with a really calm and happy household. It’s good to let children, even tiny ones (a two-year-old and a one-year-old), take ownership of their life and their belongings and to have a sense of responsibility. I take pride in watching my little ones make decisions for themselves and my goal is to do it more often rather than just expecting them to do what I want when I want it. Oh me too! And it’s always me not giving them enough time to get ready. Making it a rush. I have to try and remember they need a lot more notice before changes than I do. I absolutely love this post. This is probably my biggest challenge as a parent. Most days I feel like “I” am the one needing the discipline. I do not feel like I give my children enough room to make their own choices or to act for themselves. Without going into too much detail, everything you mentioned in this post I feel I need to work on as a parent. Every night when the noise dies down and I finally have time to think and evaluate the day I end up feeling sad. Because I know that sometimes “I am” the one being childish. I think about how wonderful, smart, active and funny my kids really are, but somehow through the hectic day I seem to miss those details. This is a wonderful post and a wonderful reminder of how capable our children really are! Kelly, I often feel sad if I review a day that didn’t go well and can beat myself up over my parenting. Just remind yourself that you care, that your kids can see that, and that tomorrow is another day. Give yourself the grace that you want to give them – you are growing in this experience as well! I love this post! The whole time I was reading it I was shaking my head up and down and saying “yes”. People think I’m crazy because I let my three year old decide things, because I talk her through her feelings, because I treat her like an actual human being. Isn’t that what she is? This is exactly the type of parent I strive to be, although I am a work in progress, and some days are better than others, little by little I’ll get it right. We’re going through the phase of big emotions with our two year right now. 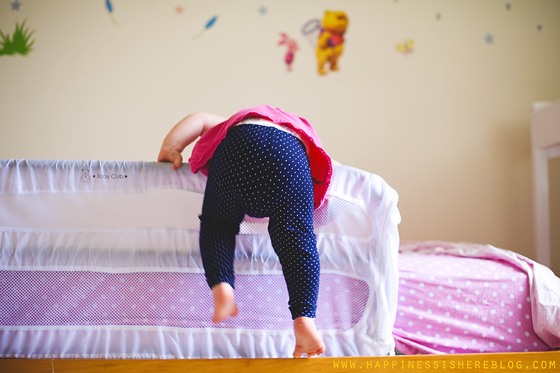 When we know her frustration isn’t about hunger, a wet diaper, or being tired we try not to fix or minimize it and just let her have her moment. It’s really hard to do! Your post was just what I needed to read today. I’m so thrilled to have found your blog! I love it! I have a ten months old baby and would like to read more on respectful and connected parenting of babies. For example, how to be respectful parent when baby protest during diaper change, or she doesn’t want to be in car seat, are distractions ok in those situations? If I’ve missed any of your posts that would be helpful could you please inform me. Thank you!